PAINTINGS, drawings and prints by some of the biggest names in modern art – including David Hockney, Dame Elizabeth Frink, Sidney Nolan and Brett Whitely – will go under the hammer at Moore Allen & Innocent’s Selected Picture Sale next Friday, October 22. An etching of Hockney’s Three Kings and a Queen, signed and dated 1961, is expected to attract the most interest among contemporary art collectors, and carries an estimate of £3,000 to £5,000. The 73cm by 32cm piece features four roughly sketched playing cards. 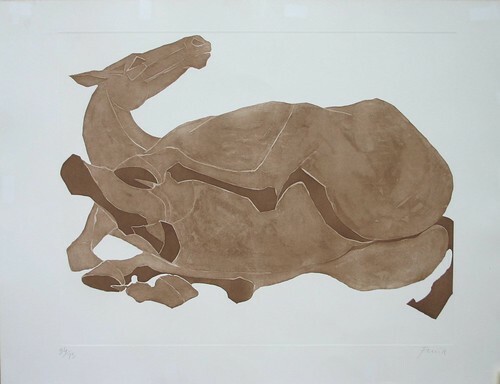 Rolling Over Horse is a signed, limited edition lithograph by Dame Elizabeth Frink, better known as a sculptor. The 54cm by 69cm lithograph carries an estimate of £2,000 to £3,000, while another of her pieces, a signed artist’s proof called A Resting Man and a Horse III, measuring 60cm by 80cm, carries an estimate of £1,200 to £1,800. A signed and numbered screen print of A Figure in Black on an Orange Background by the Australian Brett Whiteley – one of the most renowned Antipodean artists – is expected to sell in the region of £1,000 to £1,500, while signed lithographs of Leda and the Swan and A Reclining Figure by his fellow countryman Sidney Nolan carry an estimate of £300 to £400. The pieces of contemporary art will be sold alongside much more traditional pieces of work, including another expected highlight of the sale, a diminutive portrait of Jean G van Damme by the Belgian miniature painter Louis Marie Autisser (1772-1830). The 5cm by 4cm portrait comes with inscriptions to the rear and a lock of hair, and carries an estimate of £1,000 to £1,500. A study of the battleship HMS High Flier on a choppy sea by the renowned maritime painter Alma Claude Burlton Cull (1880 to 1931) commands an estimate of £2,000 to 3,000 while Louis Le Brocquy’s far more tranquil An Open Landscape with Rolling Hills and Trees in pen, ink and watercolour, signed and dated 1947, carries the same estimate. 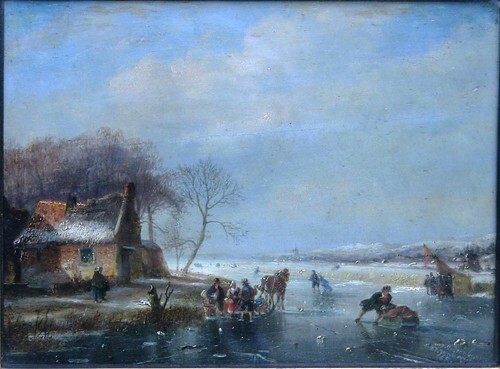 A study of a Dutch winter landscape with ice covered lake, with numerous figures on the ice, and a thatched cottage in foreground, signed by the artist Nicholas Johannes Roosenboom (1805-1880) and painted in oils on a 23cm by 31cm canvas is expected to make between £3,000 and £5,000, whilst another Dutch scene, Goat and Two Kids by Pond, painted in oils on a 23cm by 28cm panel by Eugene Verboeckhoven (1799-1881) should make around £1,000 to £1,500. This being the Cotwolds, equestrian scenes feature prominently. 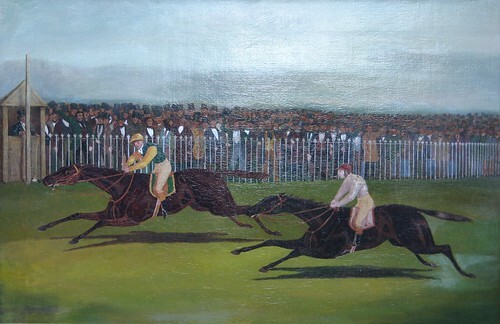 The Flying Dutchman and Voltigeur in the Great Match at York on the 13th May 1851, after J F Herring, features two jockeys and mounts in the naïve style, painted in oils on a 63cm by 96cm canvas and carries an estimate of £2,000 to £3,000, as does Indian Star, a 43cm by 53cm study of a horse in a stable by the prolific Victorian painter Harry Hall and Tolier, a study of a terrier by John Emms (1843-1912), the renowned equine and canine artist, signed and dated 1873 on its 25cm by 21cm canvas.